Over a period of 40 years, until his death in 1995, Johnson sent small, mixed-media pieces through the mail. These postcards and letters — which had instructions to either add to the work, to forward it on to another, or both — were part of what he called The New York Correspondance School, a network of artists that he invited to participate in this mail activity, which also evolved into various sub-categories like The Edie Beale Fan Club, The Silhouette University, The Ted Dragon Fan Club, Correspondence School Spitting and The Dead Pan Club, among many others. His work is the subject of a retrospective at Guild Hall in East Hampton, “Please Send To: Ray Johnson, Selections from the Permanent Collection,” on view through Dec. 16. “Methodically every day I open my mail and respond to every letter and postcard,” Ray Johnson told the Detroit Artist Monthly in 1978. He had lived a reclusive life in Locust Valley, where he retreated from New York after the tumultuous national tragedies of 1968. Jess Frost’s first priority as Guild Hall’s associate curator and registrar of the permanent collection is to organize over 2,000 items into a new database and webpage, which should be up by the end of 2018. 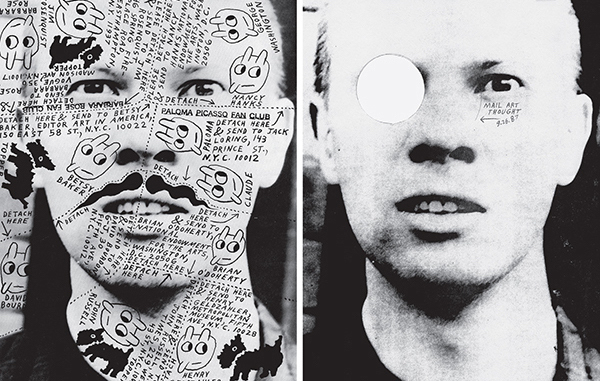 But shortly after taking her position in 2015, she came across an extensive and important cache of Ray Johnson material, including mail art and collage — sent to artist Ted Carey, and entered Guild Hall’s Permanent Collection through the Tito Spiga Bequest, an artist for whom one of the museum’s galleries is named — and was inspired to suggest that it be shown at the museum. Johnson was born an only child in Detroit to devout Lutheran parents who supported his artistic ambitions. He studied at the famous experimental Black Mountain College with Bauhaus master Joseph Albers, Robert Motherwell, and Paul Rand. In 1949 he set off to New York City as a young man to pursue his craft of abstract painting, but finding paid work in book and poster design. Over time he became friendly with Andy Warhol, Chuck Close, James Rosenquist, and other ground-breaking artists of the 1950s and 1960s. 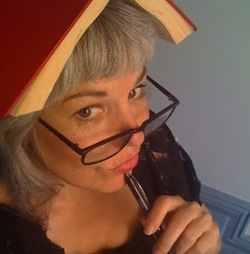 Recently curators and art historians have recognized the influence Johnson had on his colleagues, using celebrity photos and other pop-culture material, like Lucky Strike cigarette logos. Some think he began his collage art and mail art as a response to the commercial art world, which failed to give him the recognition he desired. But that seems strange for a man who purposely avoided the spotlight, and even incorporated his obtuseness into his main body of work. Ray left an astounding collection of work in his nearly empty house in Locust Valley after his death in 1995, which may or may not have been a suicide, a performance incorporating suicide, or an accidental drowning after he jumped from the bridge in Sag Harbor. According to witnesses he was last seen backstroking in the icy water. Like most things in Johnson’s life and work there was a performative aspect to to the act. He left no will or suicide note, but left a puzzle of unexplained number thirteens, including the date (Jan. 13, 1995), motel room number (2+4+7=13), his birthday and license plate number. On any day during the 40 years of The New York Correspondance School project no-one knew exactly how many letters were in circulation at any given time. Jess Frost tells me that, from what she’s read, Ray Johnson became overwhelmed with the maintenance of the project. “They would return to him and he would shelve them and then return to them and work on them and send them out again…each one might have had ten lives,” between the ones sent and returned to Johnson, or forwarded on to be altered and then returned, etc. It really piled up. In contrast to his obsessiveness and the seeming need for control in his work, Johnson made sure to leave spaces for elements of chance. Invitations to his performances, called “Nothings,” in response to “Happenings,” which were popular in the art scene of the time, might include a no-show by the artist; and although he was meticulous about his mail rituals, he could never be sure when or where his pieces might be returned, which left room for daily surprise. “Please Send To: Ray Johnson, Selections from the Permanent Collection” will be on view in Guild Hall, 158 Main Street in East Hampton, through Dec. 16. The exhibition is open, with free admission, Mondays, Fridays & Saturdays from 11 a.m. to 5 p.m. and Sundays from noon to 5 p.m. 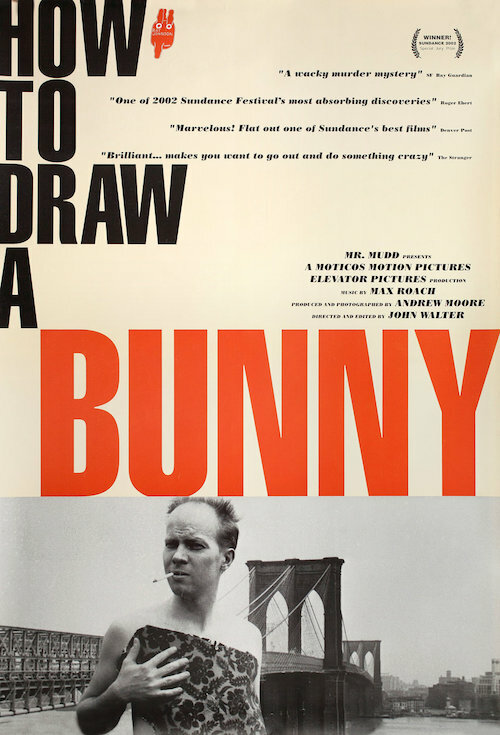 In conjunction with the exhibition Guild Hall presents a free screening of John Walter and Andrew Moore’s award-winning 2002 documentary, “How to Draw a Bunny,” which explores Ray Johnson’s work, on Sunday, Nov. 25 at 4 p.m.
Ms. Frost will also give a gallery talk on Sunday, Dec. 2 at 12:30 p.m.